Bussmann Fusible disconnect switch has a voltage rating of 600-Volts AC, 125-Volts DC and current rating of 20-Amps. 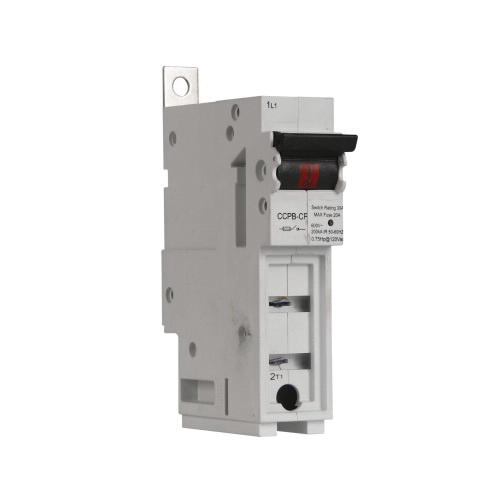 This 1-Pole, Class CF switch has an interrupt rating of 200-Kilo-Amps AC and 100-Kilo-Amps DC and a maximum load capacity of 7.5 hp at 120-Volts AC. It is compatible with 18-6-AWG solid/stranded wire. It has box lug terminals for connection and mounts on 35 mm DIN-rail. It provides IP20-degree of protection. The built-in switch/fuse interlock avoids removing the fuse while energized. It is suitable for Quik-Spec™ coordination panelboards. The disconnect switch meets UL 98 File E302370, cULus To CSA 22.2, No. 4, CE, RoHS standards.